I don’t know Jorge Garcia. I had never heard of him until yesterday when I read the story about how he was taken away from his family and deported to Mexico. As I read this modern-day Greek tragedy, I couldn’t help thinking about how similar our two lives were, how travel played a defining role in how our lives evolved, and how fate and injustice have become the determining factors in how our lives will play out. One summer, when I was twelve, my favorite aunt and uncle drove from Everett, Washington to my hometown of Wausau, Wisconsin for a vacation. Just before they were to drive back home, they asked if I wanted to come with them and stay for the remainder of the summer. Truth be told, I probably couldn’t have picked out the state of Washington on a blank U.S. map, but the idea of going some place new excited me, so I gladly accepted their offer. And it was a wonderful trip indeed. I marveled at the faces of the presidents on Mt. Rushmore and the geographic uniqueness of the Badlands. I experienced the majestic Rocky Mountains and Mt. Rainier. And I saw for the first time the vastness and beauty of the Pacific Ocean. When summer ended, I took my first train ride back to Wisconsin. That trip in 1960 began my love affair with the world of travel, a love affair that continues to this very day. 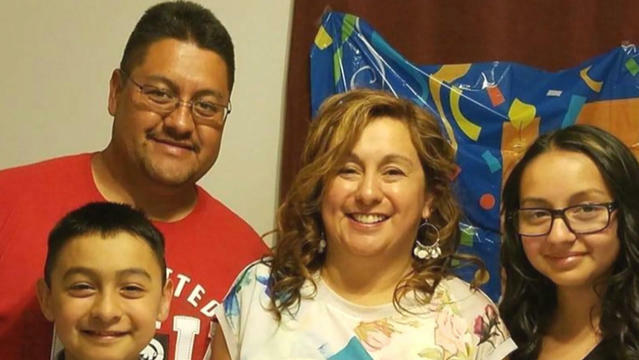 At the age of ten, Jorge Garcia (pictured above with his wife and children) also took a life-altering trip. That trip began in Mexico when an undocumented family member brought him to the United States illegally, and for the past 30 years, the United States has been the only home he has known. Since the trips we took as adolescents, Jorge’s and my lives have paralleled in many respects. I made a living teaching school in Elk Grove. Jorge, by all accounts, was a successful landscaper in Lincoln Park, Michigan. Jorge’s wife is American as is mine. He has two children and so do I. We both paid our taxes and neither of us has any criminal record. Both of us, in one way or another, have lived the American dream. But the dream has always been different for us. My American dream has always been unfettered from fear and injustice. Jorge’s American dream has always been clouded by his illegal status, but that never stopped him from contributing to that dream and taking advantage of it. Jorge tried for years to find a path to live legally in the United States. He and his wife even spent upwards of $125,000 in costs and fees since 2005 in pursuit of some form of legal status, but to no avail. Then Monday, the very day we celebrated Dr. Martin Luther King’s birthday, Jorge’s American dream came crashing down. Yesterday, he was ripped from his wife and children and deported to Mexico, a country that is nearly as foreign to him as it is to me. “How can this be happening?” you may ask. Because, where past administrations have focused on deporting criminals, the Trump Administration has decided to take a hard stand on illegal immigration and deport not only the “bad guys” but also people like Jorge Garcia who have lived a model life and contributed positively to our country. This past weekend, my wife and I traveled to Santa Rosa to see our daughter, son-in-law, and two granddaughters. In March, we will travel to Phoenix to spend time with our son. The right to travel wherever we choose whenever we want is a right afforded to us as American citizens. Jorge, on the other hand, may never again have the opportunity to travel to Michigan to be with his wife and children. Although Jorge’s life and mine have gone down similar paths, there is one very important event, an event that neither of us had any control over, that may forever make our lives different. I won the citizenship birth lottery by being born in the United States and will continue enjoying the fruits of that lottery. Jorge lost that lottery by not being born in the United States, and, although a person of solid character for the past three decades, he no longer can be with his loved ones, he no longer can earn a living for his wife and children, and he no longer can contribute to our American society and reap the fruits of that contribution. What has happened to our country? This is not the United States I have known and felt proud of for nearly seven decades. No Comment to " A Tale of Two Travelers "